A straight-talking, fourteen-year-old first baseman, benched by mono, decides to take a swing at writing poetry in Ron Koertge’s clever, compelling novel written in free verse. "Their pitcher walks our leadoff man. Greg moves him up to second with a perfect sacrifice. Fabian loops one into right. I’m up. Two on, one out. I’m the cleanup man. My job is to bring these guys home." MVP Kevin Boland gets the news that he has mono and won’t be seeing a baseball field for a while, and he suddenly finds himself scrawling a poem down the middle of a page in his journal. To get some help, he cops a poetry book from his dad’s den. Before Kevin knows it, he’s writing in verse about stuff like, Will his jock friends give up on him? What’s the deal with girlfriends? Surprisingly enough, after his health improves, he keeps on writing - about the smart-talking Latina girl who thinks poets are cool, even about his mother, whose death is a still-tender loss for which he finally finds the words. Written in free verse with examples of several poetic forms slipped into the mix, including a sonnet, haiku, pastoral, and even a pantoum, this funny, poignant story by a master of dialogue is an English teacher’s dream - sure to hook poetry lovers, baseball fanatics, mono recoverers, and everyone in between. 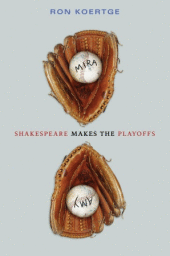 Fielding his social life is a bigger challenge for Kevin than hitting a fastball in Ron Koertge’s funny, insightful sequel to SHAKESPEARE BATS CLEANUP. Fourteen-year-old Kevin Boland has a passion for playing baseball, a knack for writing poetry — and a cute girlfriend named Mira who’s not much interested in either. But then, Kevin doesn’t exactly share Mira’s newfound fervor for all things green. So when Kevin signs up for open mike night at Bungalow Books and meets Amy, a girl who knows a sonnet from a sestina and can match his emails verse for verse, things start to get sticky. Should he stay with Mira? Or risk spoiling his friendship with Amy by asking her out? 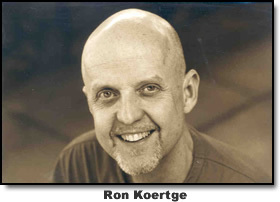 Ron Koertge, master of snappy dialogue and a deft poet, offers a fast-paced, sympathetic story that interweaves two narrative voices with humor and warmth. What was the hardest part about writing Shakespeare Makes the Playoffs? The easiest? I don't usually think in terms of "easy" and "hard." Most people would imagine that a poem like a sestina would take a lot of work but it didn't, while I kept going back to some of the haiku and tinkering with them. I expect things to go smoothly and usually they do; if I imagine something will be "hard," a lot of the time it is. So sometimes, anyway, things are only as difficult as I make them. You have a lot of different types of poems in your books; do you have a favorite? I like the funny ones. Amy's "Raven" parody still cracks me up. But I can find a line or two in the "easiest" poems that I'm just crazy about. Some poems, like the goddess Aphrodite, arrive fully grown. Others take some time to mature. The very last poem Kevin writes to Amy, the tanka, showed up at my door ready to go, and that's always nice. What is your favorite part about writing from Kevin's point of view? I started to write for teenagers and middle-grade kids when I was in my forties. A friend of mine said I was so immature that I was wasting my time writing for adults. As far as prose goes, she turns out to be right. I seem to have a pretty spunky Inner Teen. I don't have children and I don't hang around with my nieces or nephews. But I have a good ear (like a musician), so I can pretend to be a fourteen-year-old boy like Kevin or an eighteen-year-old girl like Colleen in Stoner & Spaz. What are some of your favorite poets? These are poets for adults, compared to somebody like Jack Prelutsky, okay? But I wouldn't suggest any of them if I didn't think a young person would like them and, basically, get them: Dorianne Laux, David Kirby, B.H. Fairchild, Charles Harper Webb, Suzanne Lummis. Are there any books you've read recently that you'd like to recommend to your readers? I think M.T. Anderson is a genius, so anything by him, from Thirsty to Whales On Stilts and beyond. And Michael Cart's new anthology, How Beautiful the Ordinary, has lots to recommend it. Ooh, I like the sound of the poetic mixes! Morpheus Road: The Light Trailer! Beautiful Darkness Cover and Description! Interview with Amy Brecount White! Cover Talk: What's With the Constant Makeovers? Win Numbers by Rachel Ward! Cover Talk: Grace Cover Reveal!